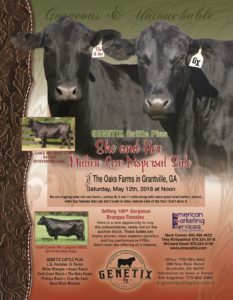 GENETIX CATTLE PLUS partners are digging deep into their herds…..selling 100+ Brangus & Ultrablack W, X and Y cattle with some great bred heifers, donors and other top proven females that you don’t want to miss. This is the BRANGUS & Ultrablack female sale of the year! The Oaks Farms in Grantville, GA.